Lupita Nyong'o has been hitting the promo trail hard for her new film 'Us' which hits theaters this Friday. Yesterday(March 18th) she was spotted arriving and leaving the Late Show with Stephen Colbert in two different looks. 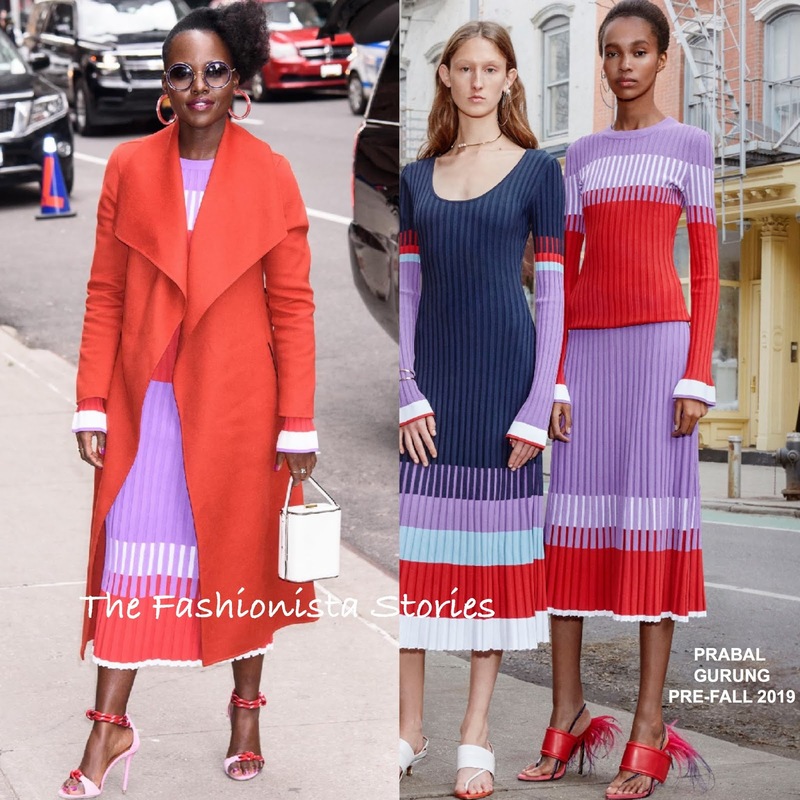 She arrived rocking a very bold, chic look which featured a red wool coat by MACKAGE, a PRABAL GURUNG PRE-FALL 2019 color-block ribbed top with the matching skirt. Love this ensemble and the HAYWARD bag, ALISON LOU jewelry & MALONE SOULIERS sandals helped to tie her whole look together. She finished up with a flawless beauty look as always. 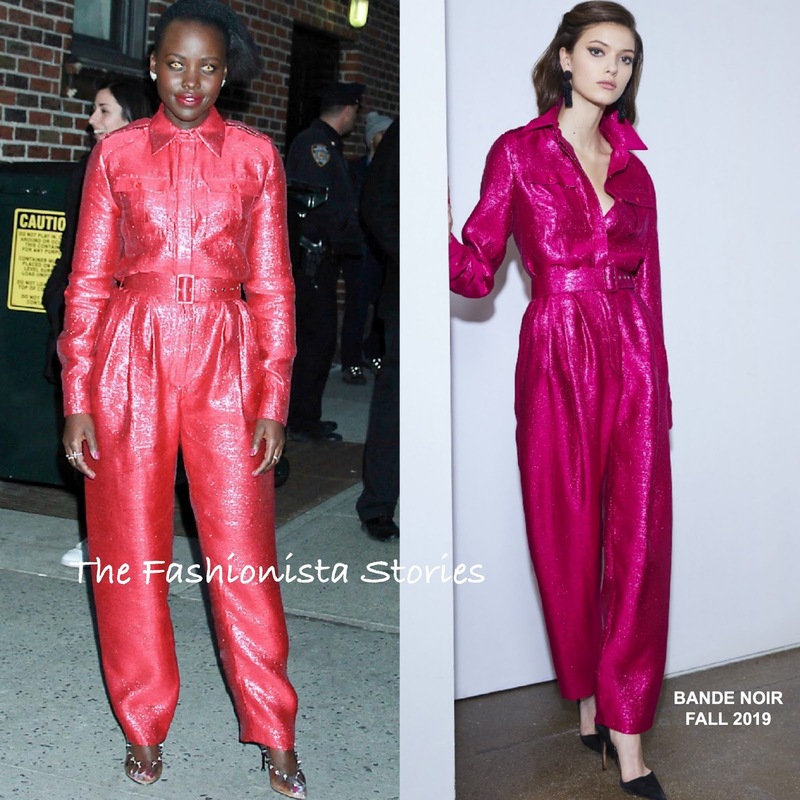 For her appearance and leaving, she shined wearing a BANDE NOIR FALL 2019 fuchsia boiler jumpsuit, with an belted waist. My only guibble here is that I wish she left a couple buttons opens on the shirt like the model. However the shape is not the best but this piece is eye-catching and it makes her standout. Lupita has been having fun promoting her new scary flick and the yellow eyes is an homage to that. SERGIO ROSSI heels topped off her winning look. This morning(March 19th) she stopped by Good Morning America and she slipped into another look from the PRABAL GURUNG PRE-FALL 2019 collection. I love this playful printed ensemble that she is wearing, which was accessorized perfectly with yellow DJULA earrings, yellow bag and red ankle strap sandals. Lupita was wearing a very cute yellow coat which she removed to take photos.